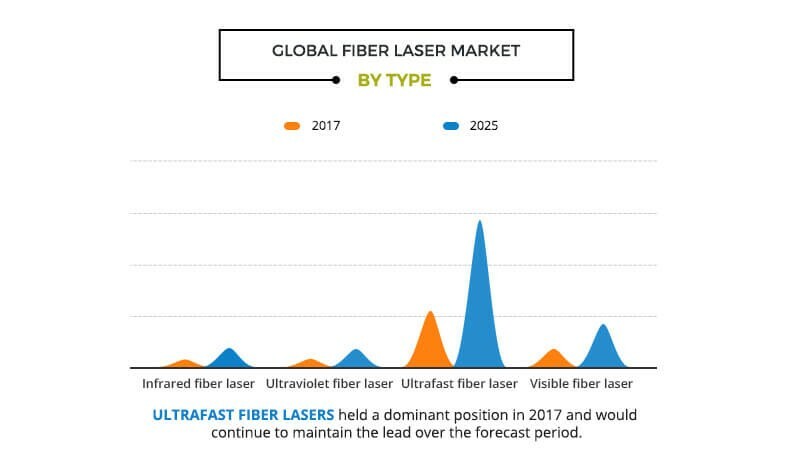 The global fiber laser market accounted for $1,782 million in 2017, and is projected to reach $4,403 million by 2025, registering a CAGR of 11.9% from 2018 to 2025. Fiber lasers are types of devices, which are optically pumped, most commonly with laser diodes but in a few cases with other fiber lasers. The optics used in these systems, are usually fiber components, with most, or all the components fiber-coupled to one another. In some systems, bulk optics are used, and sometimes an internal fiber-coupling system is combined with external bulk optics. 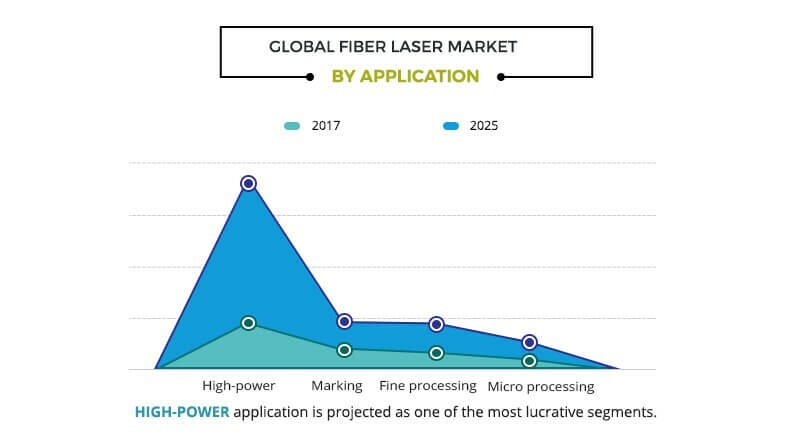 Technological advancements with respect to fiber, high beam quality & lower cost of ownership, and eco-friendly technology are some of the key factors that drive the growth of the fiber lasers market. Furthermore, increase in applications of fiber laser is expected to augment the growth of the market during the forecast period. However, reduced cutting speed while processing thicker materials and undesired pulse pedestals & non-linear optical effects are some of the factors that restrain the market growth. 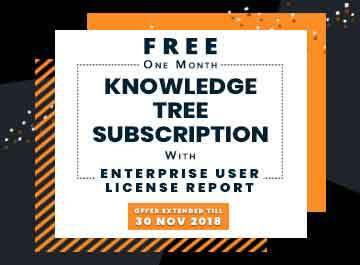 Conversely, increase in automobile and mobile electronic applications is expected to provide new opportunities for the key players in the near future. The global fiber laser market is segmented based on various parameters such as type, application, and region. Based on fiber laser type, the market is classified into infrared fiber laser, ultraviolet fiber laser, ultrafast fiber laser, and visible fiber laser. Further based on application, the market is divided into high power, marking, fine processing, and micro processing. Based on region, it is analyzed across North America, Europe, Asia-Pacific, and LAMEA. Ultraviolet (UV) lasers are used for marking on white plastics and cabling in electronics and aerospace industries. They are increasingly accepted and adopted at a large scale in precise cutting and marking of brittle materials owing to their high performance, ease of integration, precise tuning, and reliability to original equipment manufacturers and integrators. Furthermore, the cutting edge technology incorporated in UV fiber lasers make them ideal for use in precision intensive applications such as micro drilling, micromachining, surface cleaning, & thin-film sputtering, and stripping of ceramics, plastics, glass, and metals. Rise in focus of vendors on the emerging markets, such as Asia-Pacific and LAMEA, is expected to boost the market growth. 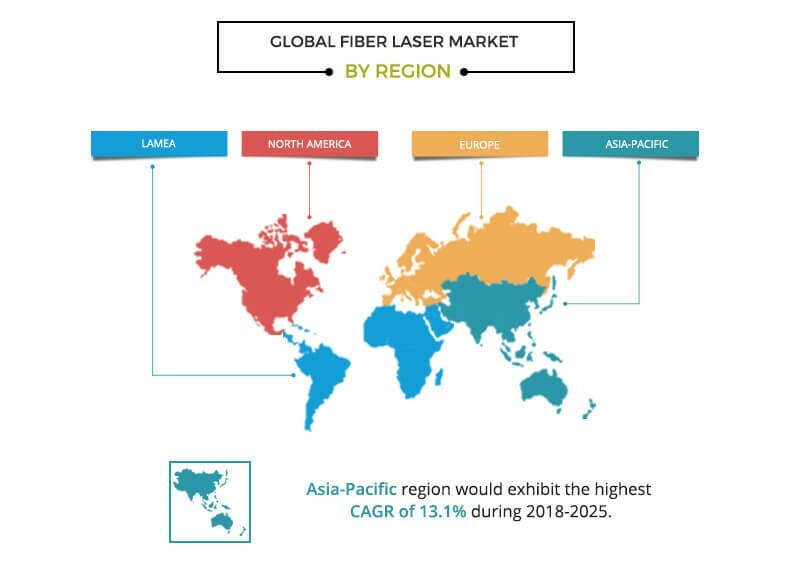 Asia-Pacific is projected to witness significant growth in future, due to increase in demand of fiber lasers in the electronics and automotive industry. Furthermore, this region presents remarkable opportunities for venture capitalists and investors, because the developed markets are comparatively saturated. Similarly, the emerging markets such as South Korea, India, and Taiwan are expected to majorly contribute to the growth and development of the fiber laser market in future owing to the rapid increase in mining and automotive sector applications. The report provides an extensive competitive analysis and profiles of the key market players, such as Amonics Ltd., Apollo Instruments Inc., Coherent Inc., IPG Photonics Corporation, Jenoptik Laser GmbH, CY Laser SRL, NKT Photonics A/S, Quantel Group, TRUMPF, and Toptica Photonics AG. The other players in the value chain (not included in the report) include O.R. Lasertechnologie GmbH, Sigma Mechatronics Pvt. Ltd., and SPI Lasers Limited. Fiber lasers consist of long optical fibers containing excellent thermal properties. They allow easy integration of the pump diodes and fiber components. The design of fiber lasers is more compact, efficient, and reliable as compared to conventional lasers. These lasers belong to the solid state laser group, and provide highly efficient and cost-effective solutions with low maintenance requirements. The key factors, such as rise in demand from end users, especially from developing countries, continuous technological advancements, and eco-friendly nature of fiber laser technology majorly drive the global fiber laser market. However, low processing speeds while cutting thicker materials and undesired nonlinear optical effects are expected to hinder the market growth. Fiber lasers are employed in a wide variety of industries including material processing, defense, automotive, and medical industries. 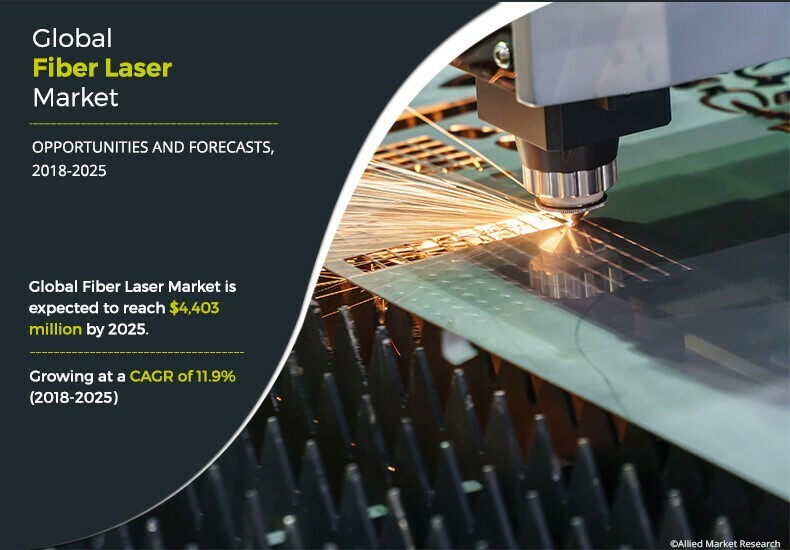 Asia-Pacific is the highest growing fiber laser market globally due to increase in demand of fiber lasers in the electronics and automotive industry. This region is projected to register significant growth as compared to the saturated markets of North America and Europe.